Men are not the enemy, but they are the problem. It's easy to feel angry, but much harder to do something about it. This book shows us how. Women are wildly underrepresented at every level of the US government: federal, state, and local. Research has shown that women in executive government positions are far more likely than men to commit to policies that benefit women, girls, and other marginalized groups, so after centuries of underrepresentation, it's clear: our best bet for creating a system that is more fair, balanced, and just for everyone is electing our first Madam President--as soon as we can. Vote Her In is organized around the inspirational messages seen on protest signs carried at the record-breaking 2017 Chicago Women's March. Part One outlines the case for why we need to mobilize now, and Part Two provides a clear strategy for how to do it. Each chapter in Part Two includes an action plan that women can complete to help each other (or themselves) attain political power and work toward electing our first woman president. 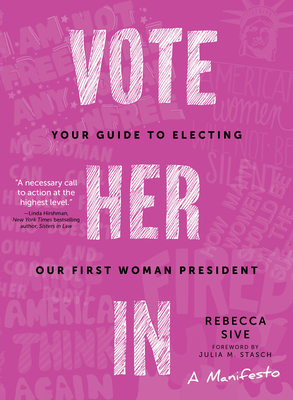 Author Rebecca Sive draws on her decades of political experience to create this crucial book, which empowers every American man, woman, and child who cares about our nation's democratic future to harness their collective power in the run-up to 2020 and, at last, form a more perfect union. Rebecca Sive has held executive positions in business, government, philanthropy, and nonprofits. She was a gubernatorially appointed founding member of the Illinois Human Rights Commission and has been recognized by her alma maters, Carleton College and the University of Illinois, for her distinguished community leadership. Sive was a founding board member of the Chicago Foundation for Women and was part of a national group of women leaders who developed women's issues agendas for Presidents Bill Clinton and Barack Obama. She is the author of Every Day Is Election Day: A Woman's Guide to Winning Any Office, from the PTA to the White House and has taught at the University of Chicago Harris School of Public Policy. Sive lives in Chicago, Illinois, and Keeler Township, Michigan.